Last month I participated in the GMC DIY Challenge where I competed against two other teams in a furniture upcycling and repurposing challenge from thrifted items at Habitat for Humanity. You can read about it, watch it, and see some behind the scenes footage here and here. During filming, I was lucky enough to do two quick DIY tip videos How to Pick and Apply Paints and How to Select Your Sandpaper Grit. 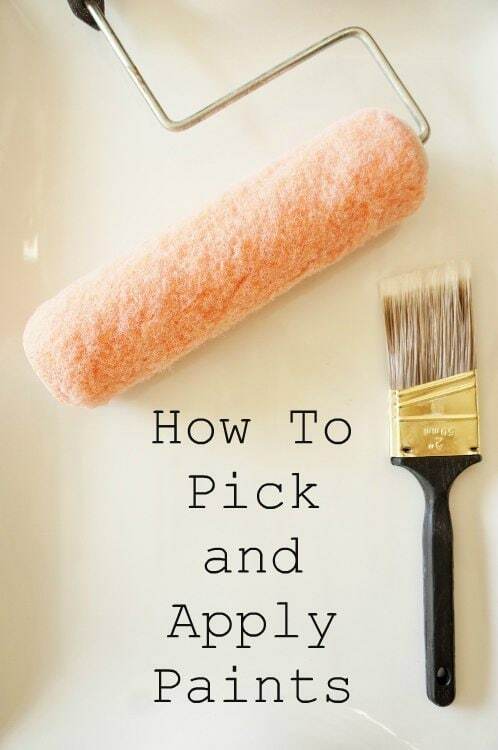 Today, I want to share How to Pick and Apply Paints. Enjoy this 40 second video! As a recap, when repurposing a piece of furniture it’s important to know what type of paint to use. There is oil based paint, latex paint, and spray paint. Latex paint is the way to go when painting furniture pieces because it goes on smoother and dries quicker than oil based paints. Oil based paints work well for trim and molding, and high traffic areas. When applying paint, for large pieces, a roller works best. It goes on smoothly, and you can cover a larger amount of area in a shorter time. For small pieces you may consider spray painting for quick application and drying time. Spray paint is great because you can find it with paint and primer in one. Spray in light even coats to avoid dripping. Allow it to dry in between coats. Be sure to check out my article for when and how to use primer for DIY painting projects and furniture makeovers. I hope you enjoyed the video! I will post the other one soon. Don’t forget to watch the GMC DIY Challenge. It was an experience I will never forget!